A relatively easy week due to recovery from KC Triathlon last Sunday. Yesterday I took off for my 25 mile bike ride (followed by 30 minutes running). I realized after a little bit that I left my flat repair kit at home. I decided to chance it. I just knew I was jinxing myself. On my way into Parkville, there is a nice downhill section on Highway 9. I was moving about 35 miles per hour and the car in front of me slowed to turn into a cafe. I slowed down and then noticed that another car going the other direction was making the turn in as well. This was about 40 feet in front of me and I was still moving around 20 miles per hour. I gripped my brakes. I still had my carbon fiber deep dish rims on (this was my first ride on my TT bike since KC Tri and I have another race on Wednesday). With these rims, braking is more difficult because the carbon fiber rims flex under braking pressure. I yelled "HEEEEEEEEY!" as loud as I could and the driver stopped which gave me JUST enough time/space to swerve in front of his bumper and around in the rough patch on the side of the road. Wheels locked, knuckles white, adrenaline rushing. The driver did say "Sorry, partner" as I managed to regain purchase on life as I continued by. The adrenaline stayed with me for the next 20 minutes as I flew down Highway FF/River Road. Don't think my flat repair kit would have saved me there. I continued for another 20 miles and returned back to that block of Parkville. I was now faced with going up that hill that I was previously flying down. 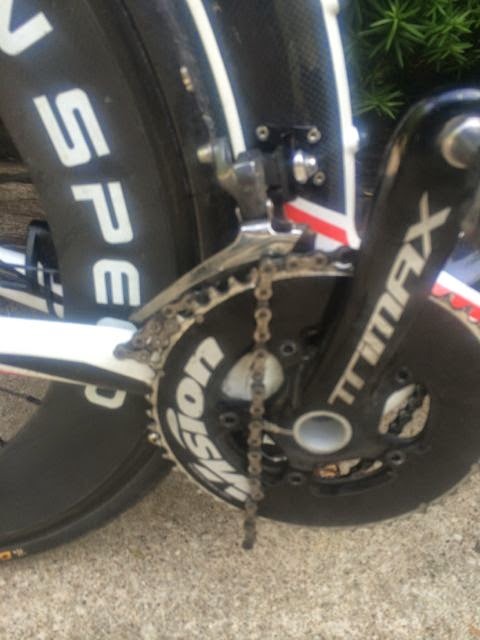 As I was starting to gear down and head up the hill, I heard my chain get cranky and then really cranky. I looked down and it had snapped. Luckily I was able to unclip in time to save myself from falling in front of an old lady and her Yappy-McYaperson dog. Flat repair kit wouldn't have saved me here. Fortunately, my phone did. TKB soon came to my rescue. I'm returning to Kansas Speedway on Wednesday to do two laps (3 miles) in the Corporate Challenge Bike Race. I did this race last year and it was a blast. Now that I am a bit more experienced with Time Trials (I did two so far this year organized by Coach Ken), I think I'll do better. I will also be using my race wheels, which should help. Again, the concern is the weather. The forecast is scattered thunderstorms but very little wind! Last year it was crazy windy. I hope that this all adds up to a sub-7 minute three miles.